Stunning canvas art print inspired by Star Wars: The Force Awakens. Limited edition of only 95 hand-numbered pieces - signed by artist Kim Gromoll! Measures 21-inches wide x 15 2/5-inches tall. 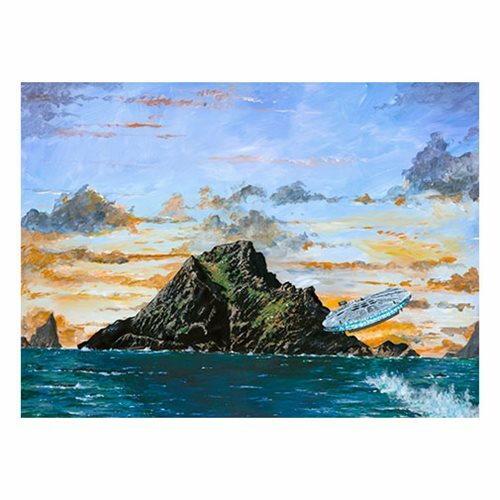 Inspired by the Star Wars: The Force Awakens movie, this stunning Star Wars Search for Skywalker by Kim Gromoll Canvas Giclee Art Print shows the Millennium Falcon skimming the water toward Luke's hideaway island on the planet of Ahch-To. An unframed limited edition of only 95 hand-numbered pieces - each signed by the artist - it measures 21-inches wide x 15 2/5-inches tall and comes with a certificate of authenticity.